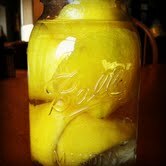 I juiced 5 lemons this morning and could not throw away the peels. I am always reading about things that lemon juice can be used for around the house. Here is a list of things that I am going to try. 1. Mix lemon juice and water in a spray bottle for a natural air freshener. 2. Make your own all-purpose cleaning solution. Combine lemon juice, vinegar and water in a spray bottle. Great to use on windows. Use newspaper to dry. 3. Squeeze lemon juice into your laundry for a refreshing scent. Lemons can also be used as a spot cleaner for any stubborn stains. To bleach your clothes, add a ½ cup of lemon juice to your rinse cycle and dry your clothes in the sun. 4. To freshen up your microwave and loosen up any baked on particles, boil lemon juice in the microwave for 2 minutes. Lemon juice can also be used to dissolve soap scum and hard water deposits. Lemon is a great substance to clean and shine brass and copper. Be aware that lemon juice can act as a natural bleach. It’s a good idea to test it out on a hidden area first. One of my favorite uses for the fruit is to put a whole lemon peel through the garbage disposal. It freshens the drain and the kitchen. Orange peels can be used with the same results. Lemon juice can also be used to treat stains because of its natural bleaching qualities. Back in the late 1990’s (when I was in high school) we would lay out at the beach and bring a bottle of lemon juice from the grocery store. We put this all over our hair and used it as a natural highlighter. It totally works too! But be careful, there is no guarantee. My hair always had an orange tint to it. Maybe it is time to try that again!